“Beer is the inexpensive luxury,” was a statement I heard on the evening news, referring to the future economy, but it got me thinking ... Gallery Stroll is the beer of the art world. A luxury yes, but one everyone can afford because it’s free! Obtainable? More so then beer in our lovely state. Some say an acquired taste; at times it can sophisticated or amature, skunky or smooth, but more often than not––it’s enjoyable. I dare be so bold as to say that life is always better with both of them, and in a perfect world you would always be able to enjoy them together. 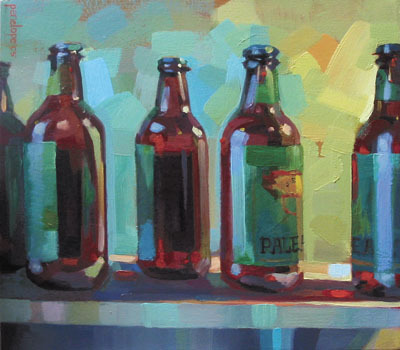 This month’s Gallery Stroll will be held the June 20 with open studios and new exhibits on display from 6-9 P.M.
Penelope Moore has mastered blending art and beer like a perfectly brewed pale ale. It’s said that artists paint what they know and have to know what they paint. I’d love to “study” with her sometime! Moore takes an object that often plays a supporting role and examines and showcases the piece, portraying it in its ideal form. The glistening beer glass just as it begins to condensate, the swirls of a Shiraz or the legs of a good pinot noir. It’s not that Penelope’s an alcoholic, at least that she’s admitted, but after years spent bartending she has a close personal relationship with the spirit of spirits. While attending the Academy of Art in San Francisco she began her bartending career catering to the fine diners at Pac Bell Stadium during Giants games. The light coming in through the windows and the reflections bouncing off the glass were almost poetic. I find it incredible that she can capture these moments and invoke the same euphoric feeling in the viewer that you would have experiencing it first-hand. After graduation, she moved to Savannah, Georgia, where she refined her taste and skills bartending at Avida, an upscale restaurant and wine bar. Bartenders had to be knowledgeable about their wines, meaning frequent trips to Napa Valley. With a jet-setting life full of drinking and painting, a natural addition to the beer and wine series are her martini glasses, decadent desserts and high-heeled shoes series. The queen of romance herself, Danielle Steele, was captivated by Moore’s work and purchased one the high-heel paintings for her personal collection. It’s a beautiful life seen through the eyes of Penelope Moore! Like to have a beer with Penelope? Come down to the 2008 Utah Arts Festival held June 26th-29th. Cheers!